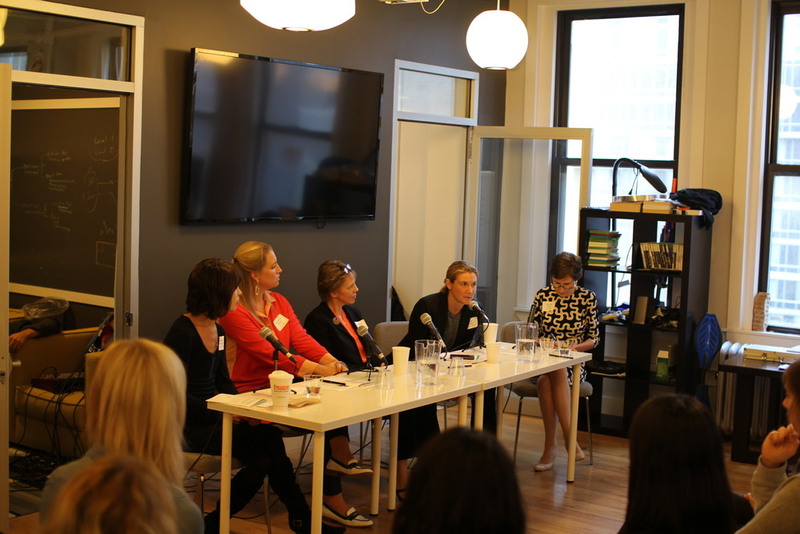 At the end of October we hosted the first women’s event in our new series, Changing the Conversation: Empowering Women in Business focusing on Planning Your Career with Leadership as an End Goal. Over 60 women (and several men!) joined us for the breakfast event, held in the office loft space of Schoology, a leader in EdTech. With coffee and bagels in hand, our audience took notes, tweeted, and engaged with the guest speakers, women representing different aspects of leadership. Moderated by CFW’s President, Cynnie King, our panelists shared their personal experiences and insights into building a career, facing challenges, managing priorities, and taking risks. By 9 am, attendees were on their way out the door, hopefully feeling refreshed and ready to tackle their daily challenges with a new sense of purpose (we certainly did!). Vanessa Cognard, Publisher at WebMD Magazine, on work-life balance: “Balance” is a bad word. “Prioritizing” is better. Kris Wiig, Enterprise Sales Director for The Americas at General Assembly, on the power of positive self-coaching: “If most of the words you use are negative, you have to find more positive things to say to yourself.” It takes 5 positive comments to recover from one negative. The women who made this possible! It was refreshing to hear genuine stories and recommendations from such relevant women with such diverse experience. Such an open, relatable, and honest group. I feel that often at these types of events I look at the speakers and think, "Well that's not me," or "I don't think that way," but that was not the case yesterday. I could see parts of myself in each one of them, and it really opened up the thinking that it is more than possible to move into a leadership role without having all of the boxes checked so long as you're willing to learn and have the confidence in yourself. What a great panel and discussion! I can't tell you how much I enjoyed the panelists, topics and questions at the end. …Please just know I felt buoyed and inspired when I left the Schoology offices. I hope you will host many more in future! It was amazing to see such a highly attended event. I was thrilled for you and happy to be a part of it. We are dedicated to promoting women in leadership positions, and look forward to hosting our next event. In the meantime, we are excited to learn about how other companies are committed to promoting gender equality in the workplace. If your company hosts events or meetings for women, we’d love to hear more about it. Email us or reply in the comments section below. Hope to see you at our next event! Pre-register for our next event here.